Join the discussion on our forums! Come discuss Crushing Walls over in our dedicated Crushing Walls discussion topic. Destroy your opponent's left and right-most minions. "It could be worse!" "It's worse." Would never say that this card was "good" but, I have it in spell hunter. I have 1k dust rn so, I could easily just replace it with a To My Side! but, I never do. This card is super situational but, when it does work it's great. Did your opponent just lay out two huge taunt minions minions and no small ones? Whelp they're now dead and you can laugh about how they didn't try to play around your terrible, terrible card as you hit their face for lethal with Rhok'delar. So the Crushing Walls have been created. Even though this card is really bad in constructed, its nice to see new animations for clears. "It could be worse!" "It's worse." - blizzard about this card every time they rose the mana cost "for balance"
Destroy your opponent's left and right-most minions. If your opponent's minions more, cast this again. Warlock can clear the board for 8 mana. Priest can clear the board for 7 mana now. Warrior can clear most of the board for 5. If they want to push a control-hunter deck, why are the cards so underrated compared to other cards out there? 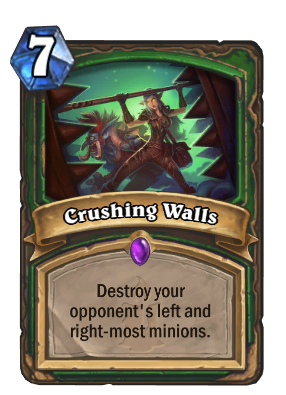 I don't think crushing walls will see much play, and even if it did, it's one removal card. Priest, mage, even rogue can remove minions for days, hunter just doesn't have the ability right now. well, this, unlike any of the other boardwipes, only "wipes" their board and therefore preserves your board presence rather than just board annihilation. Would actually run it in spell only Hunter, just because why not. I hope we actually have some Hunter-Decks we never saw before. This card would be worthless at 5 mana, while at the same time we get stupid nonsense like Psychic Scream. what is this? karazhan chess? A dangerous trap indeed, but only for the foe who pays little attention. And what good is a trap that springs only for the puniest prey? One looks foolish, spending 7 mana for a 3 mana job. And all this is assuming you don't succumb to their advances while you wait for your precious Epic to save you. My advice? Stick to the Huntress's way, or join the party of Madame Winterwisp. There may be room yet for you there. But don't say I didn’t warn you. I like it. Midrange hunter could always use a buff and I consider this the Hunter version of Meteor. Really expensive, highly conditional removal. Not worth.